Blue is not my favorite color. I don't hate it, its just not my favorite. So decided that maybe a wide variety of blues would help and I used Dee's Ohio Star die to cut a blue/white project. And I used a wide variety of background whites to add interest (thank you 2Rs for sharing your whites!) The perfectly cut pieces/corners makes it easy peasy to put these blocks together, perfect for mindless sewing. I'm linking with Oh Scrap, Monday Making, Small Quilts and Doll Quilts, and Moving it Forward. No goals this week, its going to be busy. Just SEW SEW SEW SEW!! I do seem to have a lot of blue fabrics and have made a couple of blue and white quilts over the years. I really like these stars! Over time, I have discovered that the Ohio Star is my favorite star, love how it glows and it makes me think of arms outstreached across the middle, asking for a hug. Welcome to Dakota City Quilter. I am a quilter, wife, mother, grandmother. 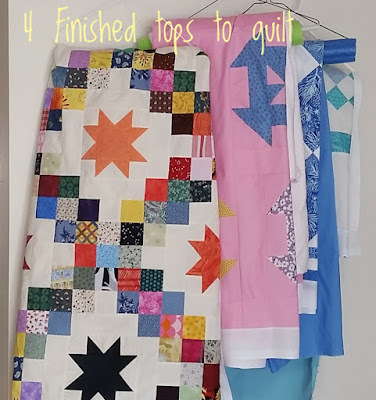 Scrap quilts are my favorites to make and donate.